A version of this article appeared in print on June 5, 2012, on page A21 of the New York edition with the headline: Remembering a Couple Who Gave Brownstones New Life. 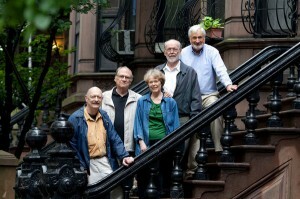 From left, Clem Labine, Joseph Sweeney, Susan Stewart, James Marshall and John Casson on the stoop of a brownstone in Park Slope, Brooklyn. You may not have heard of Everett and Evelyn Ortner, but if you have picked yourself up in the past few decades and moved out to western Brooklyn, you may have them, in part, to thank. The Ortners were early and vigorous promoters of the borough as a historic site worth preserving and a collection of neighborhoods worth nurturing, while most Manhattanites still considered it an unacceptable place even to go for dinner. The Ortners bolstered their beloved borough — and especially the Park Slope neighborhood, where they moved in 1963 — by organizing, raising money and agitating for preservation, and they did so mightily. 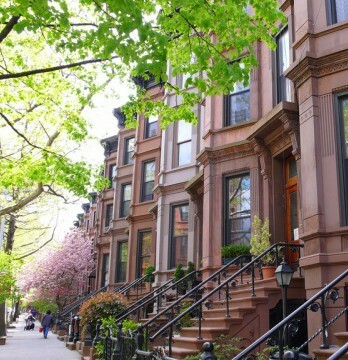 But one of their favorite ways to improve the area was by gathering up young couples from Manhattan and persuading them to buy old, shabby brownstones in Brooklyn, even as their neighbors fled for the suburbs. But buy they did, a five-story brownstone on St. Johns Place, for which they paid $25,000 in 1967. 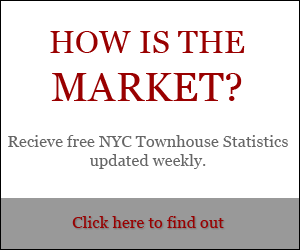 According to Jonathan Miller, president of the Miller Samuel appraisal firm, the median price for a Park Slope brownstone in the first quarter of 2012 was $2.25 million. Mr. Ortner died two weeks ago at age 92, and his wife died in 2006 at 82. Last week, five of their longtime friends gathered in a Park Slope living room, sipping seltzer and gin and tonics, to talk about the couple who cajoled them to cross the bridge. 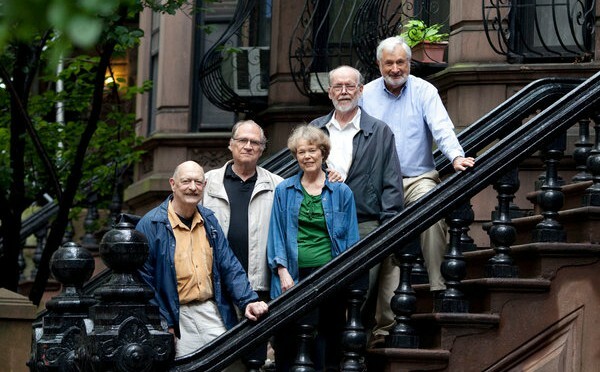 Each of these people, who had four brownstones among them, bought their homes in the late 1960s, and all but one did so at the direct urging of the Ortners. The most expensive house in the bunch was $38,000. “Everett never ceased to say, ‘I made you all millionaires, and I think you should give me a commission,’ ” Mr. Marshall, 78, recounted with a glimmer in his eye. Clem Labine, 75, a friend of the Ortners and the founder of three magazines about historic homes, recalled meeting them at a New Year’s Eve party in 1966. He bought his home on Berkeley Place for just over $25,000. 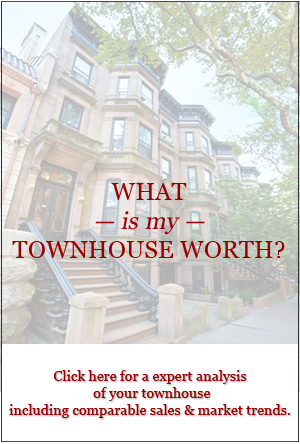 A 1966 article in The New York Times noted the wave of young families attracted to Park Slope “by the low prices of brownstones.” At the time, $25,000 (about $170,000 in today’s dollars) really did seem like a lot of money for a house in the area, the group agreed, and the people moving there were not rich. They were teachers and nurses, artists and writers, architects and engineers, they said, a far cry from the résumés circulating on Park Slope playgrounds today. There were other reasons, the group explained, that $25,000 seemed like a lot of money for a brownstone in the neighborhood, most of which had long ago been turned into rooming houses. “Seventh Avenue was noted for its bars, and there was a really tough bar right on the corner here,” Ms. Casson’s husband, John Casson, 76, said of a spot on Berkeley Place now occupied by a Chinese restaurant called Mr. Wonton. According to Mr. Casson, a bartender at the establishment who went by the name Whitey was shot on one occasion and stabbed on another. Yet, he continued tending bar there. “The joke was that the next time he’d be strangled,” Mr. Casson said. The sense of fun in Park Slope, it seems, has since evolved. Young home seekers were not the only people the Ortners sweet-talked into betting on the Park Slope of yore. Mr. Ortner had to woo the banks, too. “He would take mortgage bankers on a guided tour, with Evelyn, around brownstone neighborhoods in Brooklyn,” said Joe Sweeney, 74, who bought a brownstone in Park Slope with his wife in 1968 and met the Ortners shortly after. He would “show them what a great deal these buildings were,” Mr. Sweeney said. Friends described Mrs. Ortner as an intelligent and welcoming woman, and Mr. Ortner — a World War II veteran, a Bronze Star recipient and an editor at Popular Science magazine for 33 years — as a driven and serious man. The Ortners bought their own 1886 brownstone on Berkeley Place, just steps from Grand Army Plaza and Prospect Park, in 1963. Even today, it retains an extraordinary amount of original detail, including lattice work above the doorways, a floral plaster pattern on the ceiling and the original Lincrusta wallpaper in the foyer. While their home surely increased in value as the neighborhood flourished, they never sold it, nor did they have children to whom they might have bequeathed it. (Their friends declined to comment on the fate of the house because Mr. Ortner’s will has not yet been probated.) But even without a financial incentive, their success was tremendous — perhaps, in some ways, more extravagantly so than they might have wanted. Long after their cherished borough and many of their other causes, like the Brooklyn Academy of Music, began to thrive, the Ortners continued to promote what they believed in. They helped found a group called Preservation Volunteers in 2002, when they were both hovering around 80. And even then, they continued to encourage Manhattanites to pick up and move across the river. 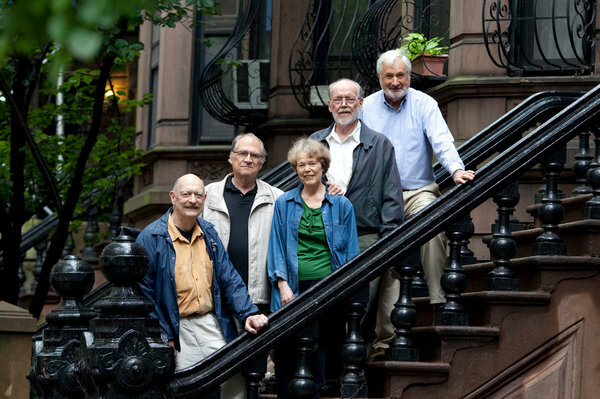 “They got us in their car and drove us around the various neighborhoods to show us the advantages,” said Ms. Ordway, who ended up moving to Brooklyn Heights with her husband, Dexter Guerrieri, the president of Preservation Volunteers.